Context: Blood transfusion services have achieved newer heights in the last decade, with developments in cellular techniques, component separation, and integration of molecular methods. However, the system of recording and reporting of the adverse events related to blood transfusion is developing countries like India is grossly inadequate and voluntary in nature. 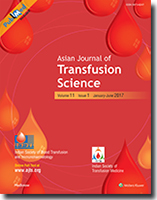 Aims: This study was undertaken to analyze the retrospective data on adverse events related to blood transfusions in our hospital. Subjects and Methods: This retrospective study was done to examine all the transfusion related adverse events reported in a Regional Blood Bank Transfusion Centre of North India over a period of 9 years. Adverse transfusion events related to whole blood, red cell concentrates (RCCs), and all other components were analyzed and classified on the basis of their clinical features and laboratory tests. Average rate of transfusion reactions with the components was also assessed. Statistical Analysis Used: Categorical variables were analyzed using the Chi-square test. P> 0.05 was taken to indicate a significant difference. Results: During this period, a total of 1,60,973 blood/blood component units were issued by our blood bank to various departments of the hospital and 314 immediate transfusion events were reported. The rate of immediate transfusion reactions during the study was 0.19%. Average transfusion reaction rate with RCC was 0.25% with febrile nonhemolytic reactions being the most common type of adverse event (37.2%). Conclusions: Awareness should be increased among clinicians to correctly prevent, identify, and report transfusion-related adverse events. These measures should be implemented to increase blood transfusion quality and safety. Introduction: Beta-thalassemias are a cluster of inherited (autosomal recessive) hematological disorders prevalent in the Mediterranean area due to defects in synthesis of β chains of hemoglobin. The aim of present study was to compare the effects of deferasirox and deferoxamine on iron overload and immunological changes in patients with blood transfusion-dependent β-thalassemia major and intermedia. Patients and Methods: This study involved 64 patients with known cases of β-thalassemia major or intermedia that has been treated with blood transfusion and iron chelators. Serum ferritin, serum iron, serum total iron binding, unsaturated iron-binding capacity (UIBC), and immunological parameters were assessed in deferoxamine and deferasirox-treated patients. Results: In deferoxamine-treated patients, serum ferritin levels were high (8160.33 ± 233.75 ng/dL) compared to deferasirox-treated patients (3000.62 ± 188.23 ng/dL; P < 0.0001), also there were significant differences in serum iron, total iron-binding capacity and UIBC (P < 0.0001) in deferasirox-treated patients compared to deferoxamine-treated patients. Immunological changes between two treated groups showed insignificant differences in levels of complements (C3 and C4) and immunoglobulin levels (IgM, IgG, and IgA) P > 0.05. Conclusion: This study indicated that deferasirox is more effective than deferoxamine regarding the iron overload but not in the immunological profile in patients with blood transfusion-dependent β-thalassemia. Background: Blood grouping is the single most important test performed by each and every transfusion service. A blood group error has a potential for causing severe life-threatening complications. A number of process strategies have been adopted at various institutions to prevent the occurrence of errors at the time of phlebotomy, pretransfusion testing, and blood administration. A delta check is one such quality control tool that involves the comparison of laboratory test results with results obtained on previous samples from the same patient. Materials and Methods: We retrieved the records of all transfusion-related incidents reported in our institute, between January 2008 and December 2014. Errors identified as “Failed Delta checks” and their root cause analyses (RCA) were reviewed. Results: A total of 17,034 errors related to blood transfusion were reported. Of these, 38 were blood grouping errors. Seventeen blood group errors were identified due to failed delta checks, where the results of two individually drawn grouping samples yielded different blood group results. The RCA revealed that all of these errors occurred in the preanalytical phase of testing. Mislabeling resulting in wrong blood in tube was the most commonly identified cause, accounting for 11 of these errors, while problems with correct patient identification accounted for 5 failed delta checks. 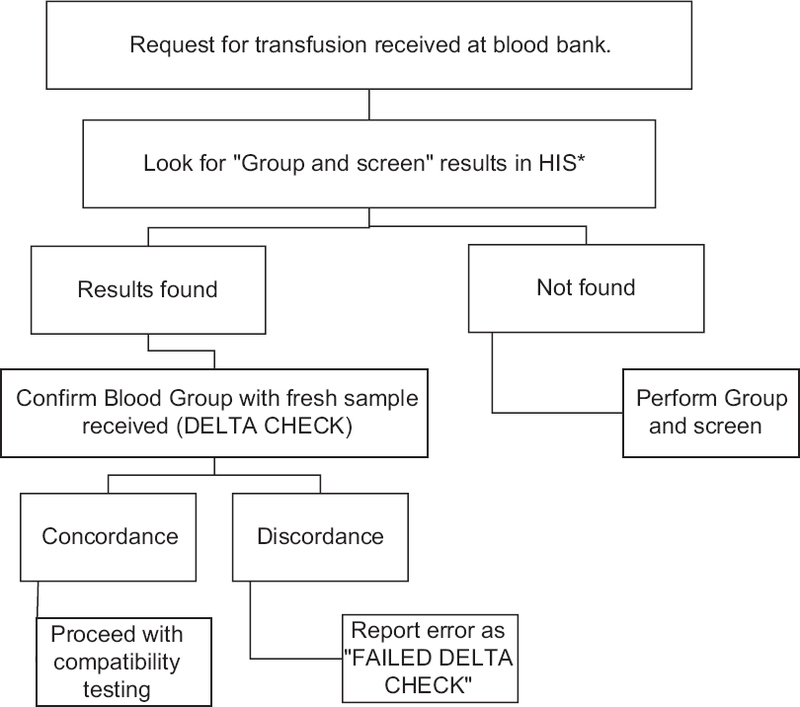 Conclusion: Delta checks proved to be an effective tool for detecting blood group errors and prevention of accidental mismatched blood transfusions. 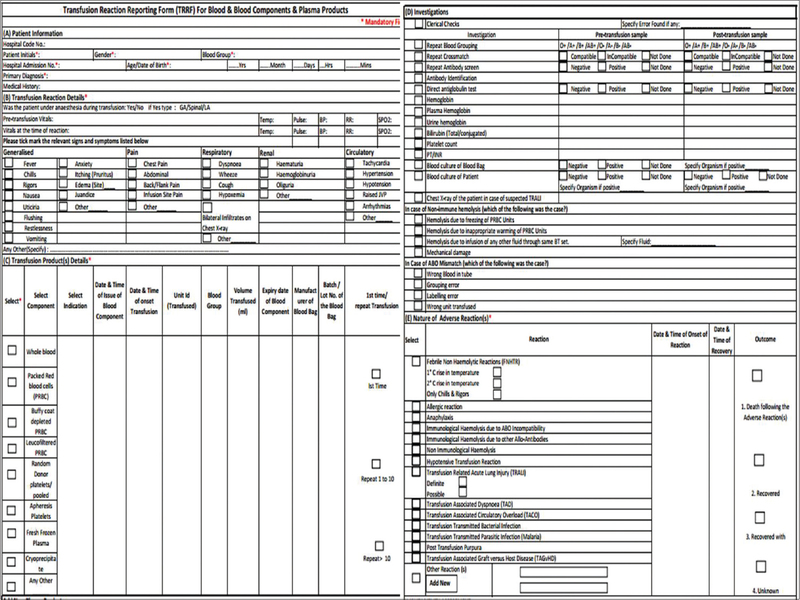 Preanalytical errors in patient identification or sample labeling were the most frequent. Background and Objectives: The occurrence of hemolysis due to transfusion of ABO plasma-incompatible platelets (PLTs) is challenging. There has been no consensus for critical antibody titers in the transfusion community. This study was conducted to understand the trends of anti-A and anti-B antibody titer levels in O group donors and to identify any specific patterns of distribution in relation to age and gender. Materials and Methods: A total of 1635 Group O PLT donors were randomly selected for this prospective study. Serial 2-fold doubling dilutions were prepared for each sample to calculate the titer of anti-A and anti-B in a standard 96 well micro-plate. Tube technique was used for comparison with the microplate method for 100 samples. Results: Out of 1635 donors, 1430 (87.46%) were males and 205 (12.54%) were females. 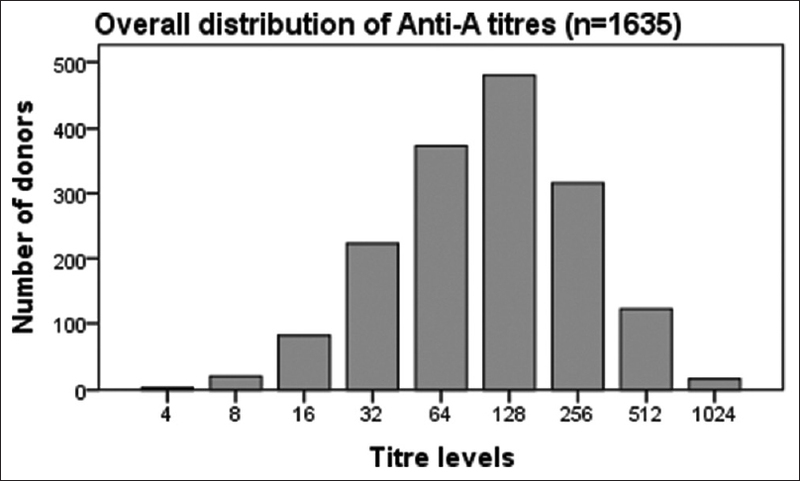 The median titer for anti-A and anti-B was 128 with range from 4 to 2048. Spearman's correlation coefficient for microplate versus tube technique was estimated to be 0.803 (P < 0.01, two-tailed). 57.12% and 51.19% of all donors had titers ≥128 for anti-A and anti-B, respectively. The geometric mean of anti-A and anti-B was 155.7 and 137.28, respectively. The titers were significantly higher (P < 0.001) in female donors. An inverse relation between titer levels and age was seen. Conclusion: Microplate can be used to perform titers in resource-constrained settings. Screening for critical titers in O group donors is essential as they are more implicated in hemolytic transfusion reactions. In the absence of a global consensus on this topic, institutes may need to formulate their own guidelines on handling ABO plasma-incompatible PLT transfusions. Background: The antiglobulin test is used to determine red blood cells (RBCs) having surface-bound immunoglobulin G (IgG) and/or complement (C3b, C3d, C4b, and C4d) free in serum or attached to antigens on RBCs. In such circumstances, the quality of the anti-human globulin (AHG) which is used in routine cross-match/indirect agglutination test plays a vital role in blood transfusion medicine. For potency testing of polyspecific AHG, it is recommended by the Food and Drug Administration and the Centre for Biologics Evaluation and Research to use fresh O +ve RBCs within 1 hr of collection for sensitization with anti-C3d. Aim and Objective: Freshly collected red cells were cryopreserved and stored at a temperature of −70°C for 30 days. These cells were then sensitized with C3d and IgG after deglycerolization. Their viability was checked by potency testing using polyspecific AHG-containing anti-C3d and anti-IgG. Materials and Methods: Anonymous left over fresh whole blood samples were collected from the Indian Red Cross Society, New Delhi, with CPDA as an anticoagulant, and the samples were treated within 1 h of collection. ABO and Rh (D) phenotyping was performed by test tube method. RBCs and plasma from the same donor were used throughout the study. Results: In this comparative study, fresh RBCs (O +ve) maintained their viability after cryopreservation and were also found to be suitable for sensitization with C3d and IgG. The potency of polyclonal AHG did not differ significantly with fresh RBCs and cryopreserved RBCs for 30 days. Conclusion: This result suggests that the sensitization of fresh RBCs with IgG and C3d is not affected by using cryopreserved cells for 30 days. Background: Many variables affect the quality of cryoprecipitate (CRYO). We investigated the effect of freezing techniques and ABO blood groups on the quality of CRYO with respect to factor VIII: C and fibrinogen levels. Materials and Methods: Ninety-six whole blood units each collected from in-house (Group I) and blood donation camps outside the hospital premises (Group II) were processed for CRYO preparation. 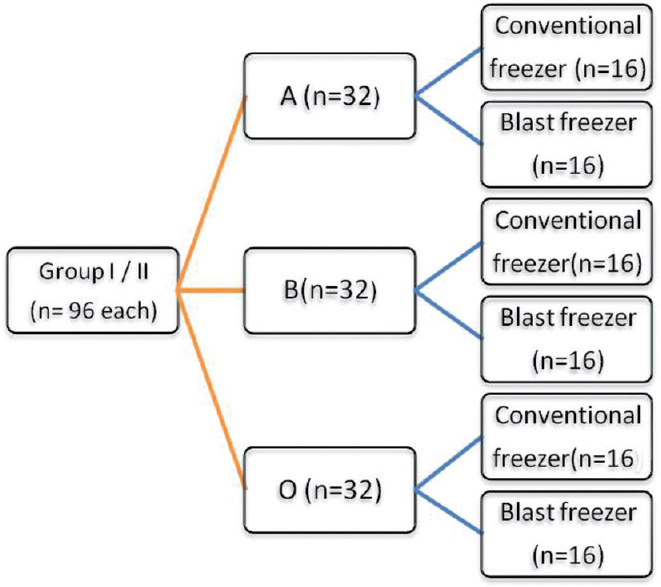 Within each group, half the number of plasma units was frozen using blast freezer and another half using the conventional freezer. The CRYOs from blood groups A, B, and O were equally distributed, i.e. 32 within each of the Groups I and II. The fibrinogen and factor VIII: C levels in CRYO were analyzed using single-stage clotting assay. Results: In Group I, the mean ± standard deviation percentage recovery of factor VIII levels in CRYO prepared using the conventional freezer and blast freezer were 58.5% ±16.2% and 66.7% ±16.4%, respectively, and in Group II, it was 55.3% ±17.6% and 70.4% ±13.4%, respectively. Recovery of factor VIII was higher in CRYO prepared using blast freezer than that of CRYO prepared using conventional freezer (P < 0.000). In Group II, CRYOs prepared using blast freezer had higher percent recovery of fibrinogen than that of Group I. In both the groups, the mean factor VIII levels in blood group A were higher than that of factor VIII levels in the blood group O CRYO. Conclusion: The factor VIII recovery in CRYO improves significantly with higher baseline factor VIII: C levels, blood group A donor, and rapid freezing using blast freezer. Rapid freezing also increases the fibrinogen yield. Background and Objectives: The US Food and Drug Administration and American Association of Blood Banks approved the type and screen approach in 1980s, long after antibody screen (AS) was introduced in 1950s. The present study omits conventional anti-human globulin (AHG) crossmatch and replaces it with immediate-spin (IS) crossmatch as part of pretransfusion testing in AS-negative patients to study the safety and effectiveness of IS crossmatch in recipients. Materials and Methods: This prospective longitudinal study was conducted on over 5000 red cell units transfused to AS-negative patients admitted to the hospital. 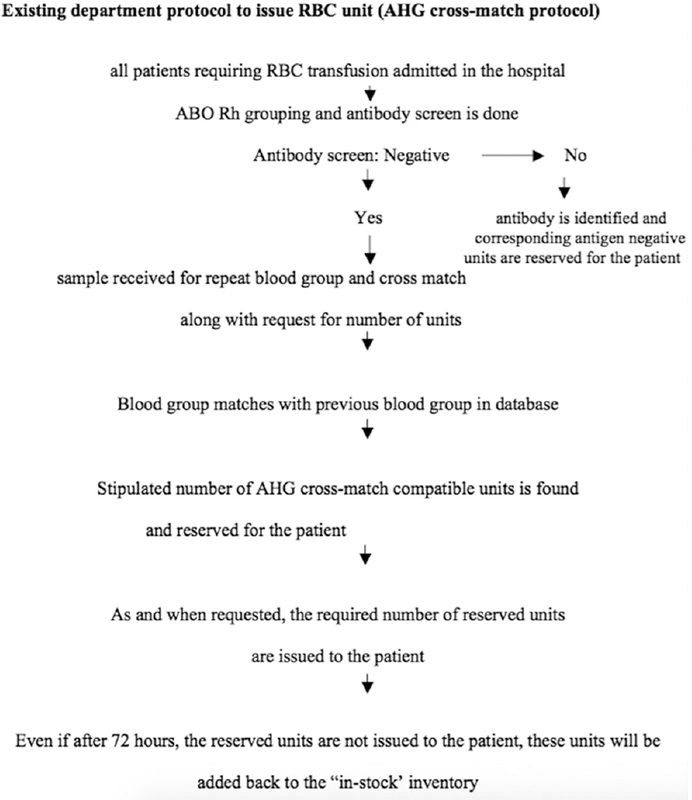 Pretransfusion testing comprised blood grouping and AS followed by IS crossmatch, at the time of issue of red cell unit. The patients were transfused IS compatible red cell units. AHG crossmatch was performed posttransfusion for all red cell units. Any incompatible AHG crossmatch was followed up as suspected transfusion reaction. Results: A total of 5023 red cell units were transfused to 2402 patients with negative AS. 99.7% IS compatible red cell units were also compatible on posttransfusion AHG crossmatch. Anti-P1 alloantibody was identified in one patient who was transfused two IS crossmatch compatible units but later both units were incompatible on AHG crossmatch. There was no clinical or serological sign of hemolysis in the patient. Conclusion: In AS-negative patients, IS crossmatch is as safe as conventional AHG crossmatch and can, therefore, replace conventional AHG crossmatch protocol. Introduction: Our study presents an analysis of the trends of ABO antibody titers and the TPE (Therapeutic Plasma Exchange) procedures required pre and post ABO incompatible renal transplant. Materials and Methods: Twenty nine patients underwent ABO incompatible renal transplant during the study period.The ABO antibody titers were done using the tube technique and titer reported was the dilution at which 1+ reaction was observed. 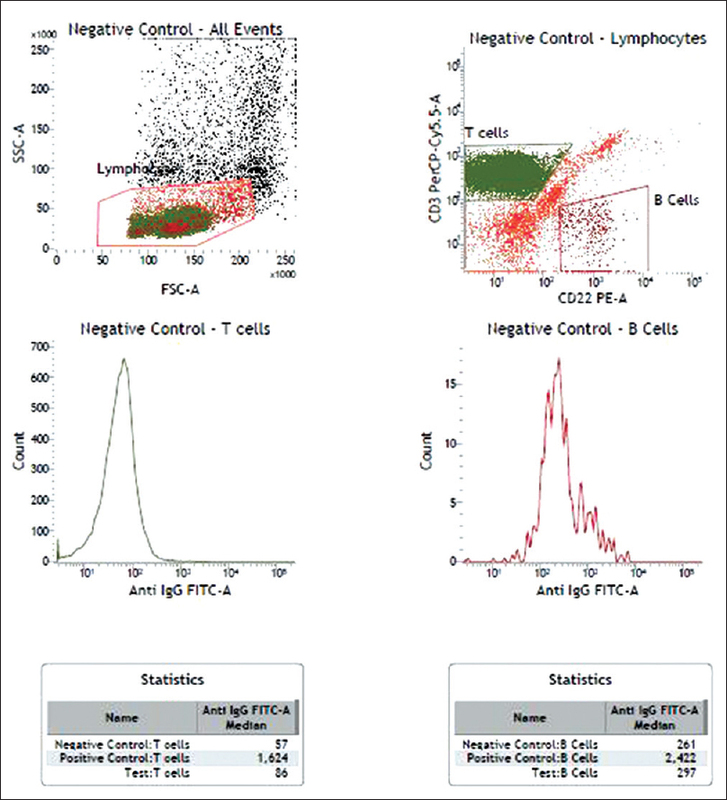 The baseline titers of anti-A and anti-B antibodies were determined. The titer targeted was ≤8. Patients were subjected to 1 plasma volume exchange with 5% albumin and 2 units of AB group FFP (Fresh Frozen Plasma) in each sitting. TPE procedures post-transplant were decided on the basis of rising antibody titer with/ without graft dysfunction. Results: The average number of TPE procedures required was 4-5 procedures/patient in the pretransplant and 2-3/patient in the post-transplant period. An average titer reduction of 1 serial dilution/procedure was noted for Anti-A and 1.1/procedure for Anti-B. Number of procedures required to reach the target titer was not significantly different for Anti-A and Anti-B (P = 0.98). Outcome of the transplant did not differ significantly by reducing titers to a level less than 8 (P = 0.32). 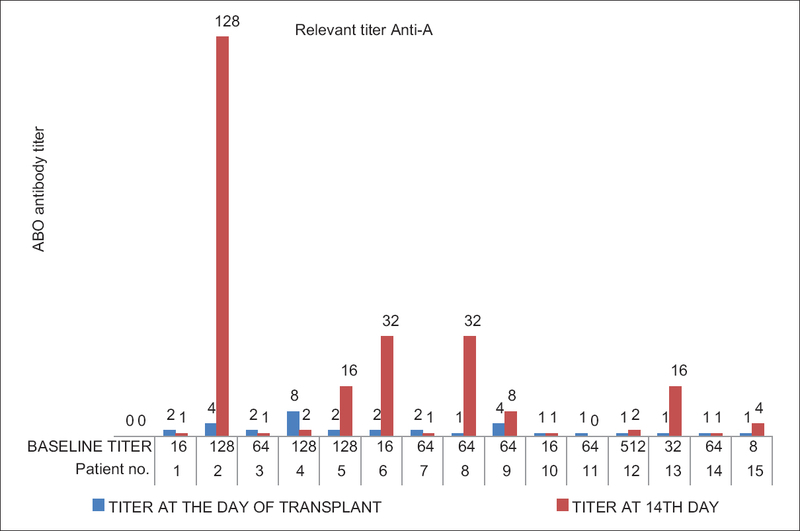 The difference in the Anti-A and Anti-B titers at 14th day post-transplant was found to be clinically significant (P = 0.042). Conclusion: With an average of 4-5 TPE procedures pretransplant and 2-3 TPE procedures post transplants, ABO incompatible renal transplantations can be successfully accomplished. Bacterial contamination of blood components remains an on-going challenge. In the majority of cases, organisms contaminating the blood components are a part of normal skin flora. Here, we report a case of bacterial contamination of blood units through contaminated donor arm disinfectant. There was a series of reactions due to random donor platelet (RDP) transfusion. The patients had features of septic transfusion reactions. On root cause analysis, spirit swabs used for disinfection of donors' arm were identified as the culprit and presence of Clostridium difficile was established. All the blood components prepared on the dates of implicated RDP units were removed from the stock and we replaced the existing 70% alcohol disinfectant with chlorhexidine-alcohol-based antiseptic rub. Further, no such transfusion reactions were reported. 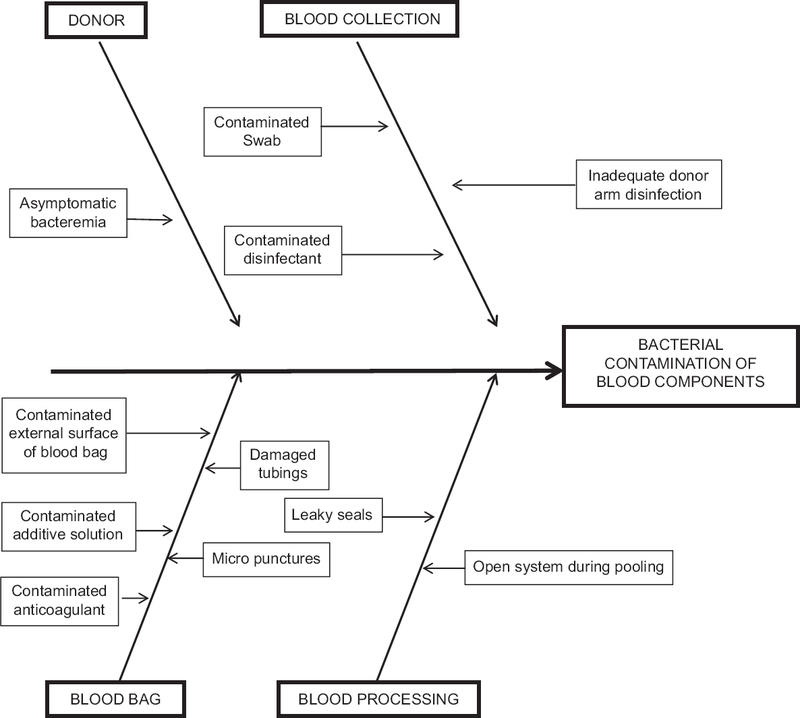 Implementation of good donor arm disinfection technique in addition to the use of blood bags with diversion pouch is proposed to be best preventive strategy for resource-poor settings. Patients of β-thalassemia major are dependent on regular blood transfusions for their entire lifetime. Development of antibodies against red blood cell (RBC) antigen which may be alloantibody or autoantibody, several times as a result of frequent red cell component transfusions, further complicates the subsequent transfusion therapy. Among the autoantibodies, warm-reactive autoantibodies are commoner and interfere in the pretransfusion testing. These RBC autoantibodies present in patient's serum potentially react with all the cells of antibody identification panel giving “pan-reactive” picture and making alloantibody identification complex. In this report, we present our approach in a thalassemia patient who presented with warm-type autoimmune hemolytic anemia, low hemoglobin of 5.8 g/dl, and three significant alloantibodies (anti-D, anti-S, and anti-Jk b) which were masked by pan-reactive warm autoantibody(s). 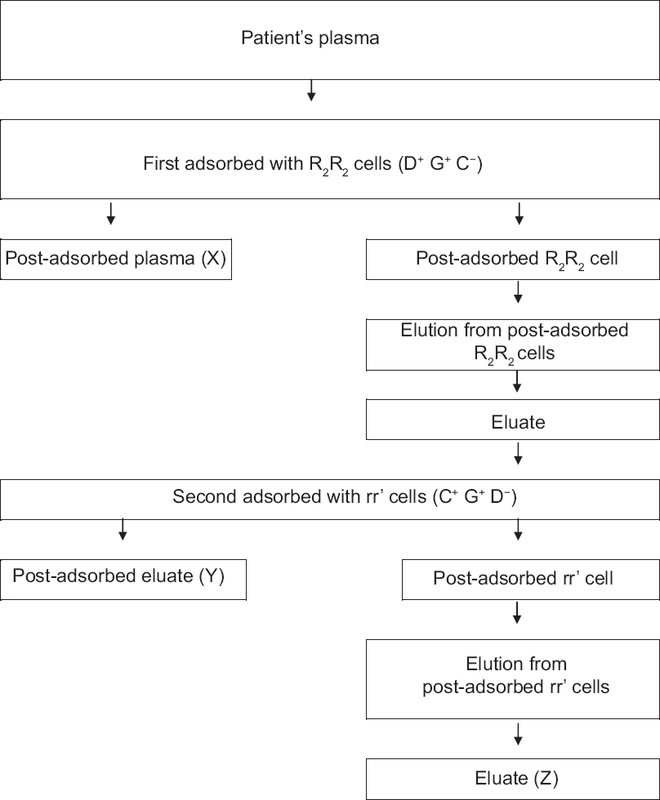 Differential adsorption was used to unmask underlying alloantibodies. We suggest that differential adsorption procedure is an effective and efficient method for autoantibody adsorption, detection, and identification of masked alloantibody(s), especially in patients with low hemoglobin and history of recent blood transfusion. Familial hypercholesterolemia (FH) is an autosomal dominant disorder due to mutation of apolipoprotein-B receptor gene causing severe dyslipidemia. Lifestyle modification and medical treatment attenuate the disease progression, but as these fail to control the blood cholesterol levels, low-density lipoprotein (LDL) apheresis comes forth as a treatment option. To the best of our knowledge, the following is the very first case of pediatric FH being treated by LDL-apheresis to be reported from India. A severely malnourished female child presented with yellowish skin lesions over different parts of the body, viz., bilateral Achilles tendon, both knees, elbows, both pinnae, and outer canthus of both eyes. She had a strong family history of borderline hypercholesterolemia and was diagnosed as a case of FH. She was maintained on diet modification. LDL-apheresis was planned as the cholesterol levels were not controlled with the diet modificationt. However, unavailability of an appropriate kit in India for LDL-apheresis led to the use of the modified PL1 kit meant for therapeutic plasma exchange procedures. We conducted two sessions of LDL-apheresis. After the first session, the LDL-cholesterol (LDL-C) level fell by 75.9% and the total cholesterol fell by 73.5%. A second procedure led to a decline in total cholesterol level by 18.6% and LDL-C by 19.46%. Subsequently, she was advised diet modification and statin therapy with regular follow-up after every 6 months. Thus, the cascade filtration technique is a safe and effective treatment option for removing the undesired lipoproteins. The G antigen of Rh blood group system is present in almost all D-positive or C-positive red cells but absent from red cells lacking D and C antigens. The differentiation of anti-D and anti-C from anti-G is not necessary for routine transfusion; however, during pregnancy, it is important because anti-G can masquerade as anti-D and anti-C with initial antibody testing. The false presence of anti-D will exclude the patient from receiving anti-D immunoglobulin (RhIG) when the patient actually is a candidate for RhIG prophylaxis. Moreover, patients with positive anti-D or anti-G are at risk of developing hemolytic disease of the fetus and newborn and need close monitoring. Thus, proper identification allows the clinicians to manage patients properly. This case report highlights a rare case of anti-G together with anti-D and anti-C in a pregnant woman. This report disseminates knowledge on identification of anti-G and its importance in pregnant women. Patients presenting with hyperleukocytosis secondary to acute leukemia, with total leukocyte count or blast count more than 100,000/μL are often considered for leukapheresis, especially if clinical signs of leukostasis are present. Leukostasis is often associated with high morbidity and mortality in patients with leukemic processes. The main goal of management of hyperleukocytosis and/or leukostasis is to reduce the blast count before initiation of chemotherapy. Leukapheresis is often used prophylactically to prevent leukostasis or to provide symptomatic relief. We, as transfusion medicine specialists, present our experience of doing therapeutic leukapheresis in patients presenting with hyperleukocytosis with or without presenting features of leukostasis.